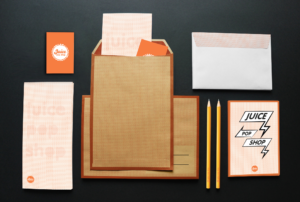 Juice, Pop Shop is a Fashion brand identity by Chiara. She is a italian graphic designer and she attended the course at “MA Degree of Visual and Innovation Design at Rufa in Rome. 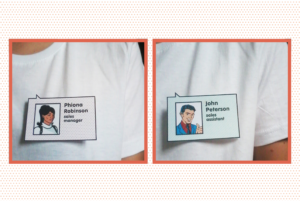 She realized this project during my course “Corporate Identity & Guidelines. She is a talent student/designer, very creative. Chiara designed this fanny and ironic Brand identity. 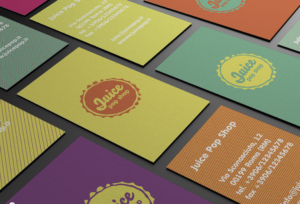 Juice Pop Shop is the brand of chain stores of clothing stores inspired by the Pop Art world and works by artists such as Andy Warhol and Roy Lichtenstein. Juice is a fashion brand dedicated to youngers “Underground, looking for originality and an alternative style that distinguish from the commonplace and rejects the Fashion trend, as well as the high price of them. Juice reinterprets Pop Art in a fresh, modern, ironic and irreverent tone without giving up a typical vintage elements of the Pop style. The brand values are distinction, originality, provocation, belonging to an alternative subculture, but also recycle and reuse (the mark recalls a an everyday item, the sign left by a bottle cap). 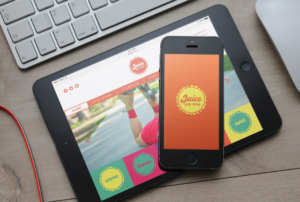 The name “Juice” is related to the bottleneck graphic mark. The choice of “juice” name because want to express a concept of youthful freshness, and simplicity and originality at the same time: in fact, in addition to the meaning of the name that associates it with the drink, the expression “to juice” also means “livening “,” animate “.